On the night of August 7, 1620, an elderly German herbalist woman was torn from her bed, imprisoned, and charged with witchcraft. The primary evidence? Supposedly giving a woman name Ursula Reingold a potion which made her sick. These sorts of accusations were often thrown about at this time, sometimes with fatal results for the accused, but what separates this woman from so many others with similar stories is that she was the mother of Johannes Kepler. Johannes Kepler was a major figure in the history of science, among many other contributions coming up with his laws of planetary motion. Less well known is that he also authored what is often called (incorrectly, see Bonus Fact below) the first science fiction novel, Somnium, “The Dream” in which Kepler narrates a dream where an herbalist witch and her astronomer son learn from a daemon what it’s like living on the Moon and offers to take them there. If I am not mistaken the author of that insolent satire called Ignatius, His Conclave [John Donne], got hold of a copy of this little work of mine, he stings me by name at the very beginning… You, my friends, who have some knowledge of my affairs, and know the cause of my last trip to Swabia, especially those of you who have previously seen this manuscript, will judge that this writing and those affairs were ominous for me and mine. Nor do I disagree. Ominous indeed is the infliction of a deadly wound or the drinking of poison; and the spreading abroad of this writing seems to have been equally ominous for my domestic affairs. You would think a spark had fallen on dry wood; that is, that my words had been taken up by dark minds which suspect everything else of being dark. This brings us to another myth surrounding Somnium. Over time Kepler’s suspicions here have morphed into the commonly stated “fact,” even among many otherwise reputable sources, that Somnium was the primary evidence used against Ma Kepler in the trial. In fact, the work was never brought up in the proceedings. Beyond that, there is no evidence to support Kepler’s suspicion that the story was the “spark” that ultimately got her arrested (not the only such seemingly unfounded paranoid musing known to exist by Kepler). The fact that the work was never brought up in the lengthy trial of his mother would even perhaps indicate that nobody involved in prosecuting Kepler’s mother knew anything about the story. 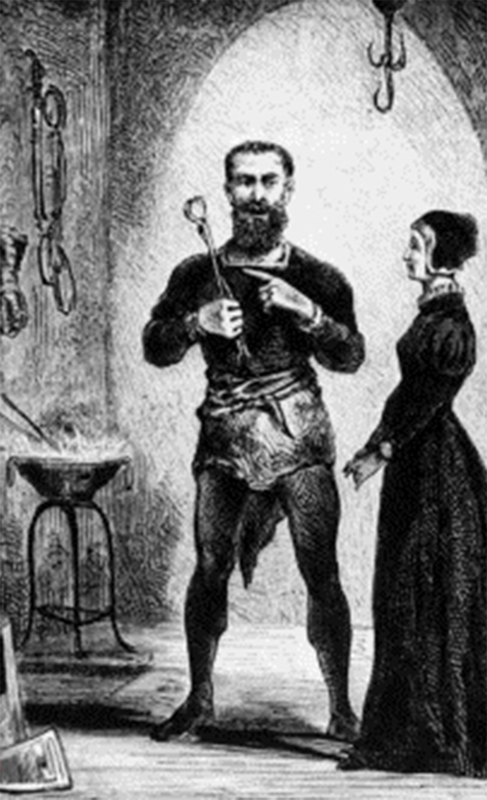 After all, Kepler himself writing a tale in which two characters who seem to be representing Kepler and his mother, and that mother figure being an unabashed witch capable of summoning daemons, would have been seen as slam dunk evidence against his dear old mom in these types of witch hunt trials. So had the story been known of by those accusing her or the prosecution, you better believe they’d have used it as evidence against her. As for the woman herself, Katharina Kepler was, by all accounts, a cantankerous old woman. She was also an herbalist and, while rumored to have been a substandard mother to her children in their youth, appears to have at least gifted one of her sons with a love of the natural world. Seemingly thinking her arrest had something to do with his story, when Katharina was faced with 49 charges of practicing the “forbidden arts”, Johannes dropped everything and came to her defense. This was a good thing as the danger here was very real. Six women in her town had been burned for witchcraft in 1615 alone. Her son clearly had to tread very carefully as he handled her defense and prepared all her briefs. In the end, having a highly intelligent and well respected son devising her defense worked out for Katharina and the evidence against her was declared to be insufficient. But they couldn’t let the poor old woman go without a big demonstration of what could have been her fate. In a last ditch effort to see if perhaps she really was guilty, despite the lack of evidence, they decided to convince her they were going to torture her if she didn’t confess (territio verbalis). “Early that morning, she was led to the torturer by Aulber, the bailiff of Güglingen, who was accompanied by a scribe for recording her confession, and three court representatives. The torturer, with the bailiff standing to one side, then shouted at her for a long time, commanding her to repent and tell the truth and threatening her if she didn’t. He showed her each instrument and described in detail all that it would do to her body — the prickers, the long needles for picking at the flesh; the hot irons for branding; the pincers for pulling and tearing at the body; the rack; the garrote; and the gallows for hanging, drawing, and quartering. He adjured her to repent, to confess her crimes, so that even if she would not survive in this world, she could at least go to God with a clear conscience. Having no real evidence against her and failing to get a confession after their little torture bluff, she was released six days later in October of 1621. Katharina Kepler died of natural causes the following April. In truth, despite it often being repeated that Somnium was the “first” sci-fi story, even by the likes of Carl Sagan, there were numerous such works written before this, even with very similar fanciful trips to the Moon. Among the more famous include Dante’s Paradiso in which Dante takes a trip to the spheres of the heavens, with the Moon being the first sphere, written about three centuries before Somnium. Then there was Orlando Furioso, written by Ludovico Ariosto a little under a century before Somnium, where the knight Astolfo takes a little trip to the Moon in an attempt to find a cure for another knight, Orlando’s, madness. In the story, the Moon is where things lost on Earth end up- in this case, Orlando’s lost wits, which are found there and brought back in a bottle to Orlando. It is so sad to see that the author of this article has decided to play the game of “political correctness” by not revealing the religion of the major “players” in the Kepler story. One can be absolutely certain that, if they had been Catholics (or if the court in question had been one of the Catholic Inquisitions), TIFO would have blared those facts to the highest heaven. Why? Because, as historian Arthur Schlesinger, Sr., wrote, Anti-Catholicism is “the deepest-held bias in the history of the American people.” In the U.S. and in other countries where Catholicism is a minority religion, many people are still so unhealthily biased that they do not even stop to think how unjust their published or spoken anti-Catholic comments are. It would be helpful for all people, regardless of religion, to be very aware of the fact that, in Europe, there was a sort of non-Catholic Christian “inquisition” for many years … and this led to the torture and killing of many people, guilty or innocent. In countries where protestantism is in the majority, such facts are “covered up,” but improprieties committed by Catholics (of the same era) are incessantly mentioned and usually exaggerated. My reason for saying that it “would be helpful for all people” to know these things is not so that anyone should be anti-protestant, but rather that no one should hate anyone … and that no one should mistakenly believe that any one religoius group is/was better behaved than any other one. We are ALL sinners. Amen. One of the biggest lies is that the Inquisition was the impetus responsible for torturing and burning heretics and witches. The fact was, there was rampant burning of witches and execution of heretics by mob justice and the Inquisition was an attempt by the papal authorities to bring some order and at least a semblance of justice to the willy-nilly murdering of any citizen unlucky enough to have crossed a person who had no qualms about perjuring themselves up to and including getting their enemy slaughtered violently and painfully at the hands of a maddened mob. The Inquisitors demanded evidence and confessions instead of lynchings and mob executions, which at least slowed down the holocaust of religious violence by barbarians of all sects and religions. But you’d never know that from the media depiction of the Inquisition. It was an absolute good that attempted, by the mores and lights of the time, to administer justice, not an evil force in the world in a very dark time. Well, there’s maybe more to science fiction than visiting to the moon – & you missed Lucian’s “True History” written about 2000 years before Dante or Orlando Furiouso (whose visit is described in 1 line). There’s also Plato’s account of Atlantis & Thomas More’s Utopia in the 15th Century are “speculative” in the modern sense.